This is the third installment in a series I'll be presenting over the next several blog posts regarding the research I've been working on with several students that we'll be presenting soon at Southerns. On average, students identified just fewer than four out of twenty-two (16%) popular Contemporary Christian acts (CC's) of which they were fans. 57% of the students were fans of at least one of the CC's listed. 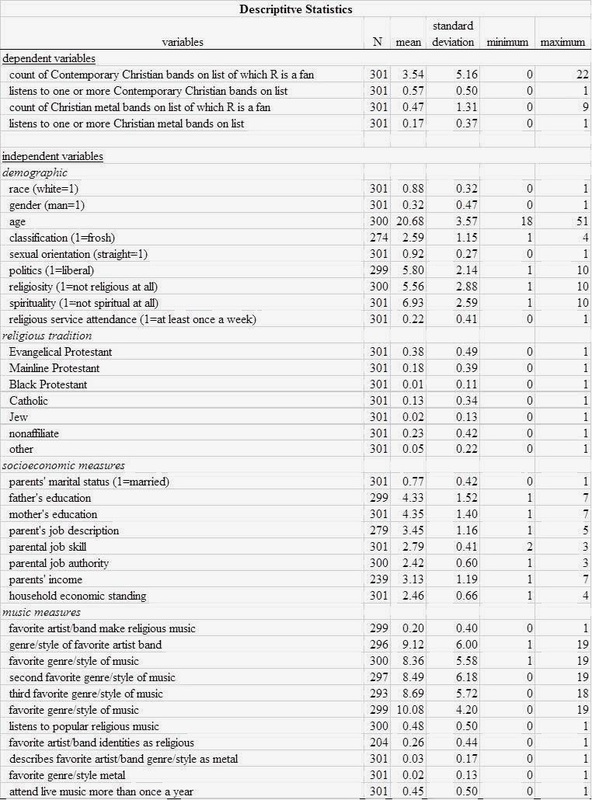 On average, students identified fewer than one out of nine (5%) Christian metal bands (CM's) of which they were fans. 17% of the students were fans of at least one of the CM's listed. There is no correlation between the count of CC's and the count of CM's. In other words, there is no significant overlap between these scenes. Neither race nor any of the socioeconomic measures are predictive of the count of either CC's or CM's. Those who are self-report as more conservative tend to like more acts. Women tend to like more acts than men. Those who are older tend to like more bands. 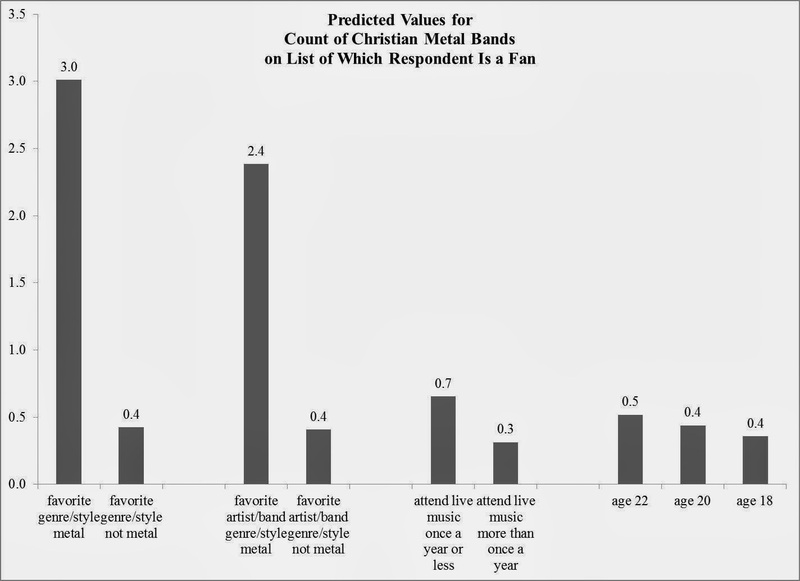 Those who attend live music performances at least once a year tend to like more bands. 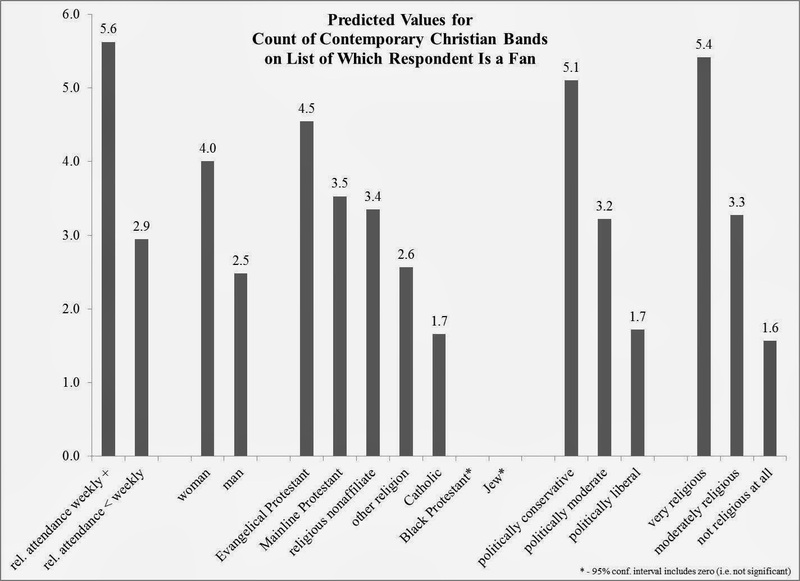 Gender is not predictive of the count of bands. In other words, we don't have evidence that this is a guy's thing. 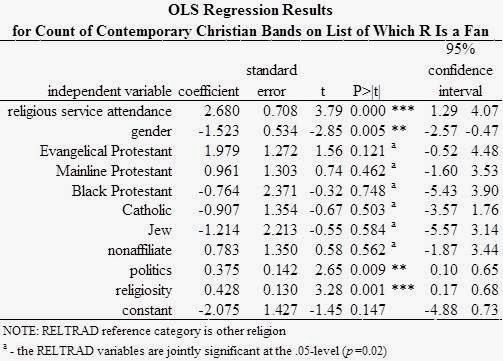 While being a fan of Contemporary Christian acts is correlated with several measures of religion (i.e. self-reporting as very religious, attending religious services at least once a week, and being Evangelical Protestant), being a fan of Christian metal bands is not. In fact, being a fan of Christian Metal bands is mostly about being a fan of metal music in general. This is great. I don't know much about metal music in general, but given what I do know I'd bet that secular metal engages themes similar to religion more than other secular popular music. By this I mean ideas about the supernatural, good, evil, etc. Cool project!